First of all, I'm not saying I'm an expert of relationship or body language. I wrote this because of a personal request from my (not so) little sister. She's in her college life (in different city) and of course she is distracted by a lot of guys's attention (ahem). It's good to hear her stories, although sometimes I got overwhelmed with her questions, which basically has the same point. Is he into me? Why does he act like that? What's with his attitude today? Okay, then, I hope this post will keep up with her love life lol. 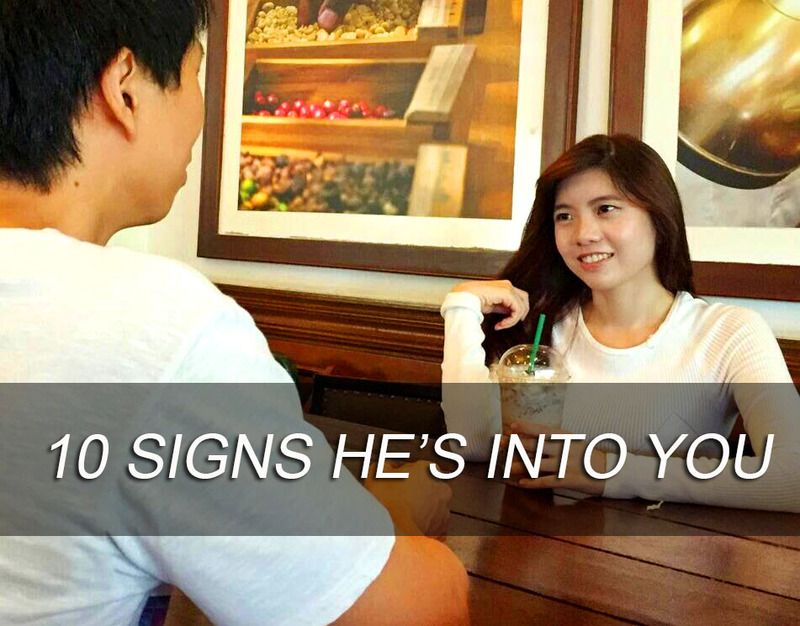 No matter how busy this modern-day life, if a guy's into you, he makes time for you. He calls you whenever he feels like it, even if it's just to say hi or ask how's your day going. He will make an effort to see you regularly. He makes plans to see you because he wants to spend time with you. According to Patti Wood, a body language expert and author of Success Signals, A Guide to Reading Body Language, big pupils mean your crush is looking at you with desire. "Dilation is a brain response that occurs when you like and are attracted to something, " Wood tells Cosmopolitan. Not only the eye contact, but his body language will do the same thing. If he leans in when you talk, keeps his torso facing you, maintains eye contact, and doesn't cross his arms and legs defensively, he's showing emotional availability and interest through his body. Because this position exposes his man parts, it's a vulnerable position that could mean he's willing to put himself out there (literally and emotionally) to get to know you. If a guy's smiling, this doesn't necessarily mean he likes you, but if you guys seem to smile whenever you look at each other, for no real-reason, it's highly likely this guy likes you. When you like something (or someone) - you smile. The same goes for him. When you talk to other guys, and laugh. When he knew, there's other guy close to you, or keep calling or texting you. He'll try to act he's cool with it, but he'll be checking up on you and the other guy, trying to figure out whether that guy is making progress or not, whether you're interested in that "moron" or not. He might sigh or make a cranky face. Try to pick up on these little clues. Even when he doesn't really have to, he touches you. Accidentally, or just subconsciously, he makes some kind of physical contact with you. The more physical contact a guy makes, the more obvious is that he likes you. But, be careful, because there's also some guys who's totally a player who just wants to take advantage from you! You have to be able to see the difference between those who's really into you and who's just want to play around. This is extremely important, because if there's one thing men are great at, it's not listening. They are great at ignoring things they don't want to hear. There. I said it. But, when a guy's really into you, he not only makes a part of the conversation, but he also asks for your input, listens intently and responds appropriately. Well, I hope you guys find this article useful, especially for you, little sis ;) Let me know, what you think by leaving comments here, thank you for stopping by! This is adorable, it reminds me of a Cosmo article! Nice post, I love it!! So cute and great tips! Thanks for sharing! What a cute article. Brings me back memories from my dating days. I'm glad this reminds you! Dating days are the best!